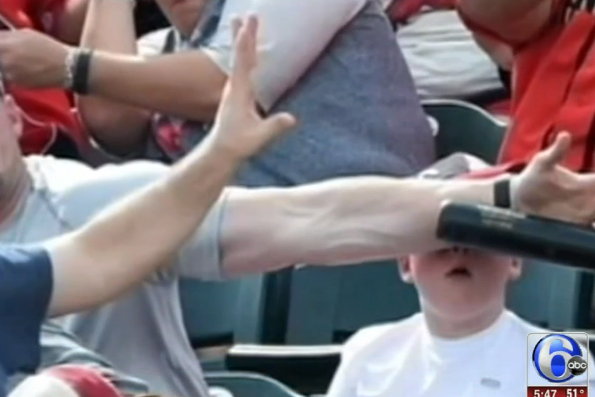 Father saves son from flying bat at spring training. A father is being hailed a hero, or, in his words, just a dad, for saving his son from a flying baseball bat that soared into the stands and straight for his 8-year-old son's face during a spring training game in Florida. Shaun Cunningham, 37, and his son, Landon, were at the Pittsburgh Pirates' spring training game against the Atlanta Braves in Orlando when, in the fifth inning, outfielder Danny Ortiz lost his grip on his bat on a swinging strike, the Pittsburgh Tribune-Review reported. A Tribune-Review staff photographer at the game snapped images of the scene, and those photos have since gone viral. Read more at the Tribune-Review and 6ABC.com.